Learning how to draw caricatures is a particularly unique skill, which has always fascinated me. It uses the combination of drawing skill and psychology...plus a helping dose of humour! The challenge one has to meet in drawing a good caricature is to maintain the subject’s likeness yet manage to deviate from that natural likeness by exaggerating the subject’s unique characteristics. By definition, a caricature is humorous. You have to exaggerate the individual’s unique characteristics in order to make it humorous, but you’re a walking a fine line, because those exaggerations cannot detract from the personality of your subject. Because of the very nature of a caricature, the physical likeness has to be maintained, while the psychological likeness must also be implied. You have to be an artist and a psychologist all rolled into one. Close observation is crucially important in this style of drawing. Sit and look at your subject. Find those facial characteristics about your subject that make him or her unique. Then make a series of preliminary drawings in which you experiment exaggerating the subject’s features, and decide which drawings don’t work and which drawings work. 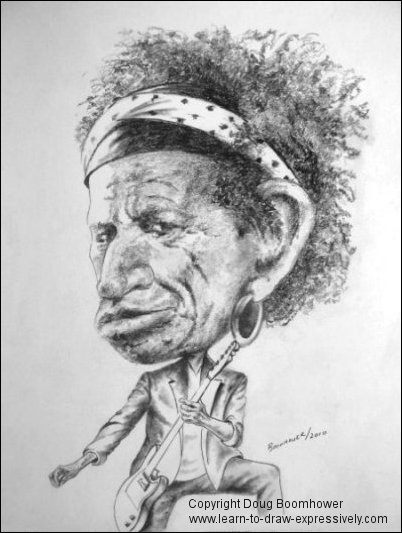 I sat down with pencil and paper, looked at Keith Richards, and drew. I was always aware that I was drawing a caricature. That means emphasizing what you think are the individual characteristics of a person and accentuating them in a complimentary way. It is not computer-generated. I drew it with a piece of paper and a pencil. One last philosophical comment; caricatures are psychologically driven. Here I have defied the laws of reality and yet it captures the personality of Keith Richards . . . go figure. After observation, for the purposes of caricature, I saw this man as . . . glasses, nose, intelligently thoughtful eyes, and frizzy hair. The raised eyebrows and overly exaggerated furrowed brows, reinforce this brilliant man's thoughtfulness. As in most caricatures, the body is very small in comparison to the head. This adds to the humour. However, the body can serve another purpose. In this case, he is leaning on a typewriter, implying that he is either writing or working on his next great idea. This entire piece is done with ink cross-hatching. Cross-hatching implies shading, but it is a series of intricate ink lines. In other words, there is absolutely no "smudging" in any of the shaded areas. This style lends itself to newspaper reproduction. 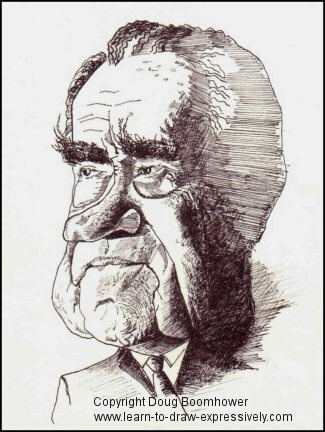 These next two caricatures were well-known Canadian politicians. When learning how to draw caricatures, look for any unusual features. 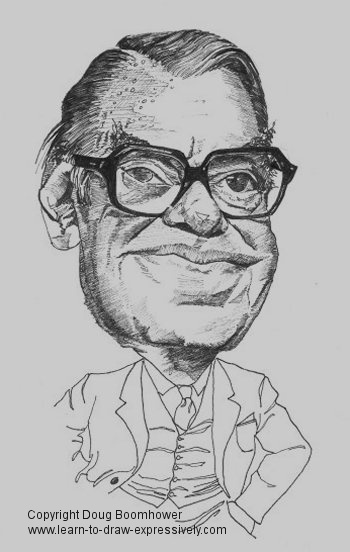 This is a caricature of the late Canadian politician, Paul Martin Sr. 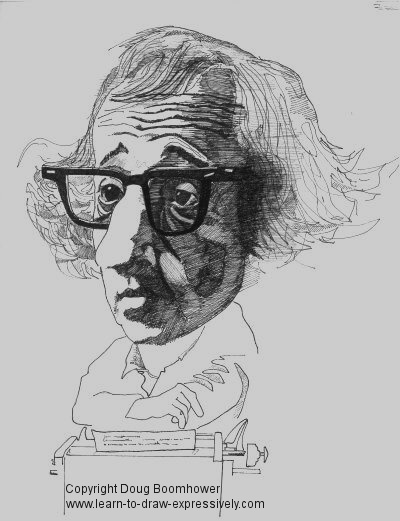 He had a wandering eye, which offered an opportunity for a caricature artist to emphasize. Of course I emphasized this facial characteristic humorously ... definitely not critically. His son, Paul Martin Jr. followed in his father's political footsteps. 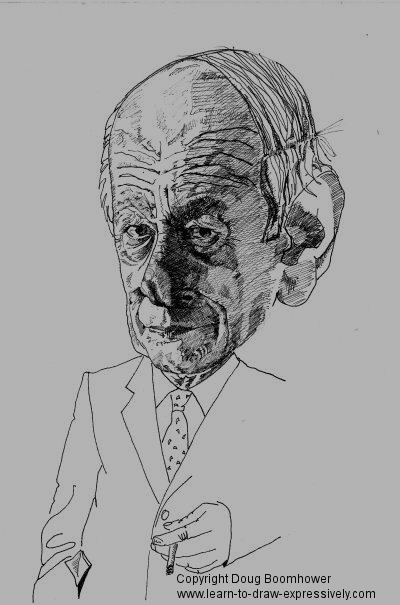 René Lévesque had large ears, a unique nose, and often had a wry expression. I emphasize them all humorously. He was always smoking cigarettes and was usually engulfed in a cloud of smoke. Therefore, when I added his body, of course I included a cigarette.